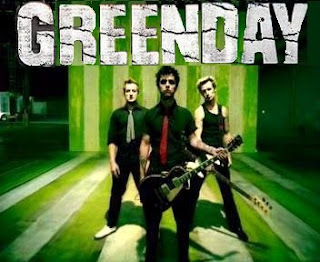 Kingdom of God Media: Green Day -- "Nice Guys Finish Last"
And now the joke's on you. Is there any benefit in practicing charity, selflessness, purity or honesty? Do these things ever pay off? According to Green Day, the answer is "No" and, from this band's worldly perspective, that answer is correct. Don't worry, though... Green Day's perspective is extremely limited. At first glance, the saying, "Virtue is it's own reward," seems really weak. It doesn't sound nearly as powerful as "Blast mercilessly through anyone who gets in your way." In a fleeting sense, it pays to lie, cheat and steal. Such action will help you get what you want right now. However the other outcome of such action is a tainted conscience, so the liar, cheater or thief never really gets to enjoy the spoils of his efforts. As the apostle Paul wrote to the church in Rome, "their conscience bears witness and their thoughts alternately accuse or else defend them" (Romans 2:15). John said something that you'd have to experience to really appreciate: "if we walk in the Light as God Himself is in the Light then we have fellowship with one another, and the blood of Jesus, His Son, cleanses us from all sin" (1 John 1:7). Who knows what it's like to be cleansed? Who can appreciate the incalculable riches of being spiritually free, liberated from all guilt and tainted thinking? If there is any way to find out about these things, it is through Jesus' teaching. He was appointed by God to teach all comers how to adopt a heavenly perspective, which rises above the "Nice Guys Finish Last" rut-thinking. Whether you ever embrace a meaningful life-perspective depends on whether you take care of business with Him first. It is better (though far more difficult) to live by faith in God than to live by sight alone. Thus, people who live and die by their unyielding dedication to an unseen, higher Cause most effectively improve the world around them (though their peers might notice this fact only after they are dead and gone). The good work that Christ gives his followers is difficult, but the end-product makes it all worthwhile. Developing and utilizing one's faith-based muscles if beneficial in every way, both in this life and the life to come. Something you said from your post that resonates with me is: "though their peers might notice this fact only after they are dead and gone.."
engagement or confirmation of friends, loved ones, etc; committing/converting their lives to Christ (especially if you've personally had an opportunity to talk to them about Jesus saving us from the consequences of sin). All of that said, I guess the point is that death is a sobering fact that God can or does use as His punctuating point to a series of urgings, an epitaphial epiphany to come out of the world and into His light if you will.